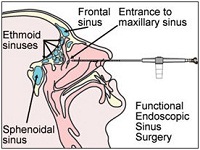 Functional endoscopic sinus surgery (FESS) is performed on people with chronic or severe sinus infections. The way it is performed using endoscopy through the nostrils. This procedure avoids external cuts. It is quite common for a patient with sinusitis to undergo a rigid endoscopic examination of the nose and a CT scan of the nasal sinuses before the surgery. You will be asleep under general anaesthetic. The operation is done through the nostrils. This means that there will be no scars or bruises on your face. An endoscope is inserted into the nose, where the diseased sinuses are identified and are opened up using special instruments. Furthermore, if there are any polyps, present in the nose, they are removed. The natural pathways of mucus drainage are enlarged to prevent blockage. In some cases, to get access to the sinuses the surgeon will need to straighten the partition of the nose. This is called septoplasty. The operation lasts one to two hours depending on the extent of the disease. In certain types of operations, it is safer for the patient to be unconscious, otherwise the pain would not be bearable. This is performed by well-trained consultants (anaesthetists) when they use medications to send you to sleep. The way these medications work is that they block the passage of signals along the nerves. How long do I have to fast? Food or drink in the stomach is dangerous during and immediately after the anaesthetic. For this reason, you will need to stop eating food 6 hours before the operation. This includes white coffee, milk, supplement drinks or sweets. Between this time and 2 hours before the operation you can only drink clear fluid, which is water, black tea or black coffee only. However, two hours before the operation you should be NIL BY MOUTH. You will only need to stay in hospital for the day. You will be reviewed a few hours after the surgery and after you have passed urine and eaten you will be discharged. It is necessary for someone to accompany you when you leave the hospital since you may still feel weak from the operation and the anaesthetic. Following the operation your nose will feel blocked. This is expected to last for 2 weeks. You may also have some blood-stained watery discharge, which is also expected to last for one to two weeks. You normally need a few months’ time to start breathing again normally from your nose. It is expected for you to have some nasal and sinus pressure and pain for the first few days after surgery. This may feel like a sinus infection. You will also be prescribed painkillers to alleviate the pain post-operatively. Following surgery, you may feel very tired for a few days. This is something normal and is expected to happen. It is common for a patient to take one week to two weeks off work following surgery. However, this is adjusted according to individual needs. You will be able to fly 2 weeks after your surgery. However, this also depends on your clinical examination during your follow up appointment one week after the surgery.